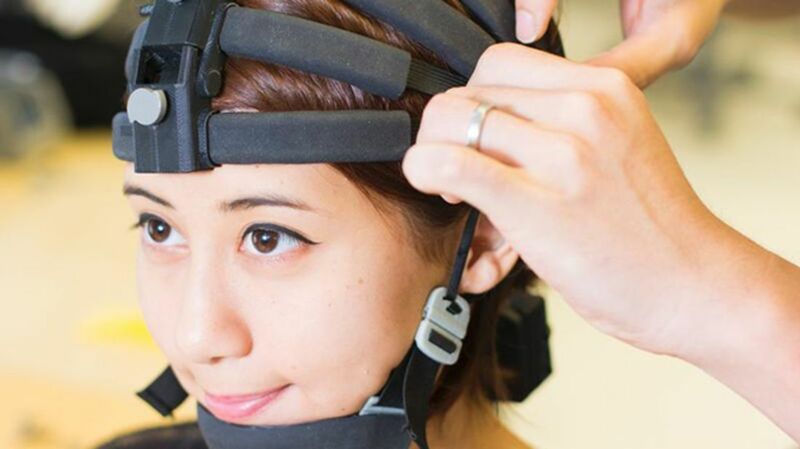 A new high-tech headset could make analyzing brain activity feasible even outside the lab. Developed by alumni of the University of California, San Diego through a company called Cognionics, the dry, portable system makes it easier to take electroencephalograms (EEGs)—tests used to diagnose epilepsy and other neurological disorders and study brain activity. Normally, getting an EEG is a messy, wet process. In order to get a high-quality reading on what’s going on in your head, dozens of nodes are attached to different places around your scalp, often with the help of conductive gel or paste. However, researchers working on the Cognionics headset claim it’s just as accurate as a traditional EEG, without the gels or wires. They document their findings in a new study in IEEE Transactions on Biomedical Engineering. Their elastic headgear is embedded with 64 flexible, spider-like sensors that can read brain waves through your hair. It’s certainly not something you’d hit the runway in, but it could feasibly be something you could use at home. You could drive in it, play video games, or perform low-level exercises. Traditional EEGs are near-impossible to take out of the laboratory setting, because they require hooking up a patient to a machine and gluing electrodes to precise locations on their scalp. More portable consumer systems are not terribly accurate, but if we can only see how brains work in a research lab, there’s only so much we can learn. It’s difficult to replicate real-world results in an artificial setting where patients are stressed out or can’t move. An accurate EEG system that can be used while the patient is going throughout their day would be a boon to neurology research.